Silverchair - News Archive - SILVERCHAIR LIVE PHOTOS FROM LOLLAPALOOZA AVAILABLE SOON! 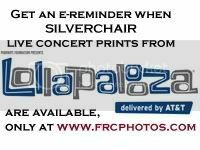 Professional, artist-authorized photos of Silverchair captured live at Lollapalooza, will be available exclusively at Front Row Center! The 'suitable-for-framing' photos will be sold as 11" x 14" and 8" x 10" archival prints, unframed. You can sign up for an e-reminder that will notify you when these pics are available! Just click on the banner or go to www.frcphotos.com.